Hi loves! How have you been? How's the weather where you live, is it starting to feel like Spring yet? It's been quite nice here lately, not too warm yet but sunny. I guess the weather got stuck on my mind because this nail art looks almost tropical! See? Doesn't it remind you of sunsets, cocktails, beach vacations and all that? To create this look I started with a base of Essie Bump Up The Pumps. I scored this one along with Jump In My Jumpsuit and Jiggle Hi, Jiggle Lo with a nice discount a while back, and I just couldn't resist these lovely shades ^^. So Essie Bump Up The Pumps went first, it's such a creamy and opaque shade! I barely needed 2 coats and it applied buttery and easy. I wanted to prevent my fingers from a lot of messy polish so I used my El Corazon Cuticle Defender around my nails, applying this also gave my basecolor some time to dry. The gradient was created using Essie Jump In My Jumpsuit. It took around 2 rounds of sponging to get a nice and even result. These shades blend so nicely! But, just a gradient wasn't what I had in mind, so I grabbed BP-19 because I liked the leafy design on it. My stamping polish is China Glaze 2030. I'm always amazed at how different the design looks before and after topcoat - the topcoat brings the metallic shade to life. Using the Cuticle Defender made for such little clean-up, I wasn't even annoyed with the metallic bits getting everywhere. Amazing! Isn't the result just fabulous? I loved wearing these nails and actually wore them for 3 days straight - that doesn't happen too often with me! What do you think of this look? Would you have added stamping to the gradient as well? Tell me in the comments! This is just absolutely stunning! 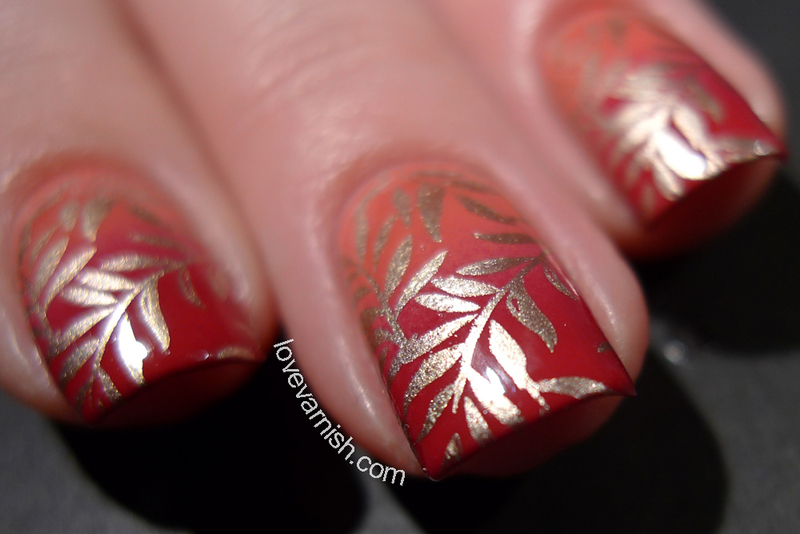 *swoons* I NEED that China Glaze gold for stamping too! Amazing!! The gold looks so good with the gradient! I've never done stamping before but I'm really eager to try it out! 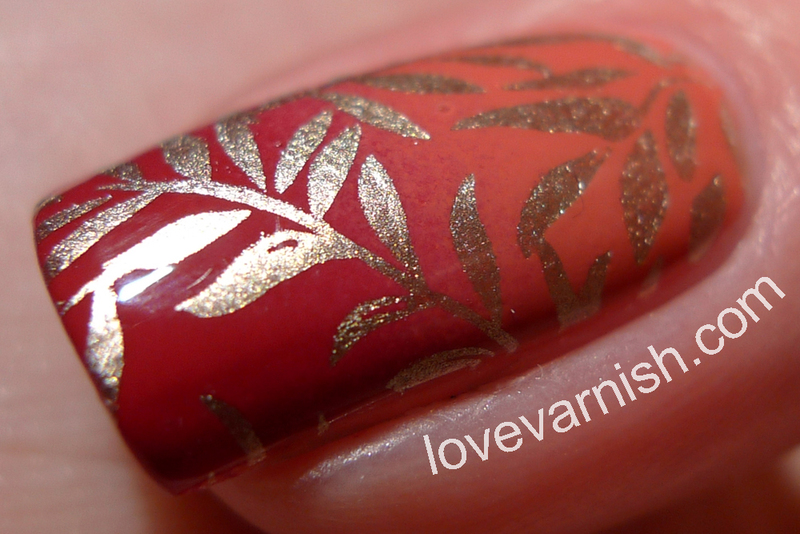 I love how smooth your gradient is and that stamping works great with your colour choice. I never stamp over gradients because I'm afraid to ruin them, but it's sooo pretty! 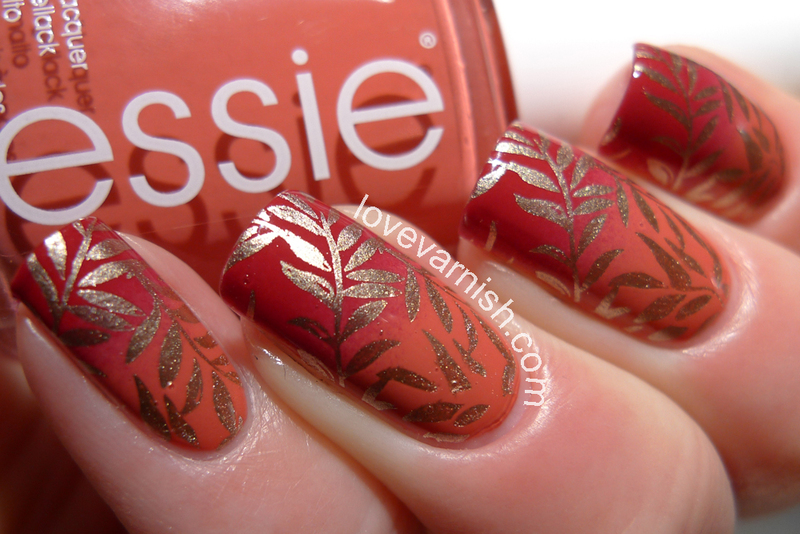 Stamping over gradients makes for such a grand effect - these are gorgeous, hun! I definitely stamp over gradients intact I'm wearing one right now. I have a sunset gradient with all beautiful holos with tribal stamping on top. I really like your gradient the colors are subtle and with the stamping it makes you think of an evening on some tropical island with umbrella drinks. 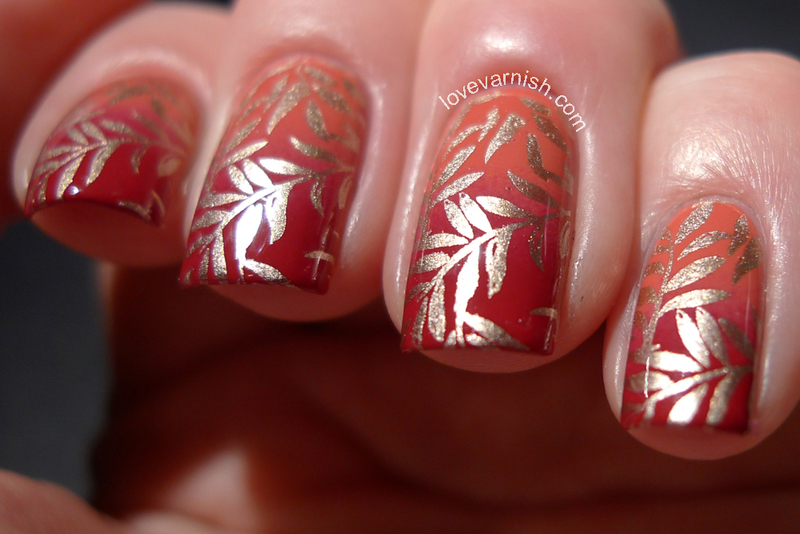 The gradient is absolute perfection with the gold stamping. I just LOVE it! I'm kind of obsessed with stamping over gradients at the moment so this post is perfect timing! Love the colors you chose. Well I sure have missed looking at your beautiful nails and manis. You are my favorite! I need to stop being MIA so I don't miss out! Ah-May-Zing! I love everything about this, it makes me yearn for a sunny destination! These are so pretty!! The colors are beautiful! Yes! 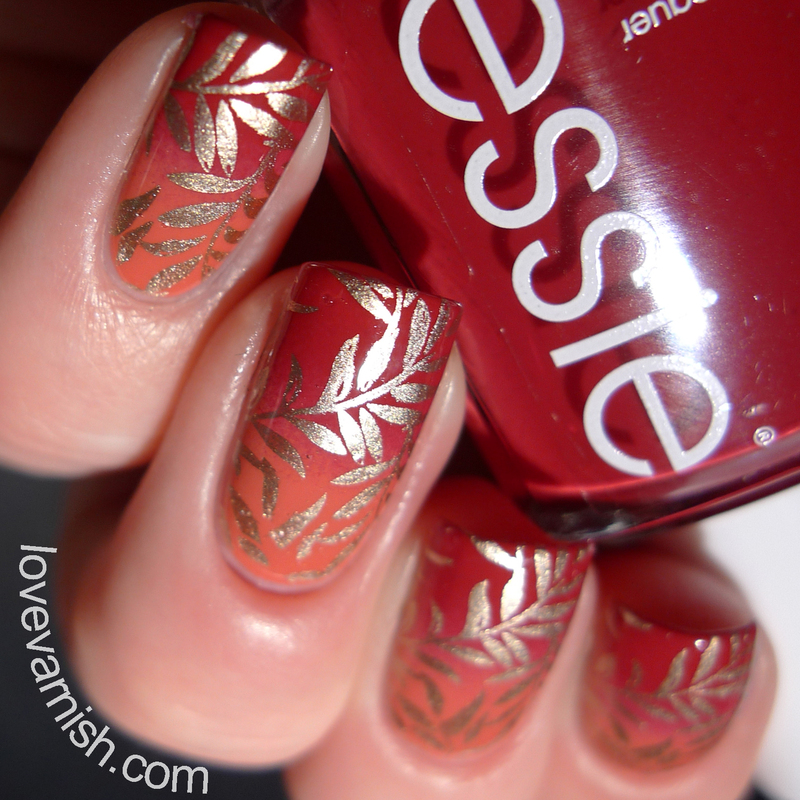 This gradient screams out stamping to me so I would of done the same thing. It turned out beautifully. Gradient. Stamping. Perfection. I mean that's it ! I have nothing else to say !! Love it !! Perfection! There's just something special about these fairly classic shades combined. Thanks so much Christine! I adore it for stamping :). Thanks! It's a great plate indeed :). Yay for stamping! And thank you <3. Thanks so much Bella! Stamping is so much fun, well at least when you get the hang of it, the start can be slightly frustrating ;-). You should really try it, it's so much fun! And well, with your stamping skills I don't think you need to worry at all. Yay for double nail arts! Yours sounds amazing as well. Holo gradients are so cool! Thanks so much! Yeah, I really did enjoy this look for sure :). Thanks so much! It's always such a striking look. Aww stahp, you make me blush! Haha we all want vacation all the time :D! I can't seem to leave gradients alone no more ;-). Thanks! ♥♥♥ you are too kind!